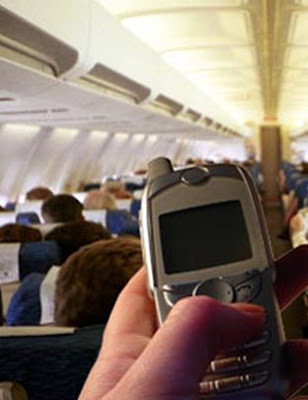 Soon cell phone use in flights will be the norm. Imagine texting and chatting away at 32,00 feet! Whatever happened to the caution that using cell phones in flight was a danger to navigation? Simple: the airlines realized they can make big bucks on in-flight cell phone usage. But a majority of travelers polled (84%) said they were not in favor of airborne wireless calls in the air. It seems most passengers use a flight time to relax and not stay connected to the office or cares on the ground. The real reason you can’t use your cell phone is that it may interfere with mobile networks on the ground. But that doesn’t sound quite as compelling. Think about it: if cell phones were so dangerous to the plane’s navigation system, why allow them on board? Many, phone are left on by mistake (including mine), and many people make furtive phone calls in the air. The airlines, desperate for revenue, are now seeing a big bucks in their potential cut of sky-high calling charges… and are miraculously making safety concerns disappear. Low-cost airline Ryanair is equipping its Boeings 737’s with base stations called picocells provided by OnAir Technology, a company backed by Airbus, Europe’s Aviation Giant. These picocells use satellite links to allow mobile phones to be used during flight without interfering with ground-based networks….and the airline takes a healthy cut of revenues allowing it to keep its low fares in place, and so it goes. 82% said they didn’t want people talking on phones during flights. The Association of Flight Attendants found that 63% of those polled wanted the ban maintained. I predict the economics will win out. With a $ 3.00 bucks a minute tab, the airlines will soon be inviting us to call home! Often.